The thyroid gland is located on the anterior aspect (front) of the neck. It can be felt just below the thyroid cartilage, or "Adam's apple." It is a butterfly shaped organ that stretches across the middle of the neck just below the thyroid cartilage, with its "wings" spreading towards the head, on either side of the thyroid cartilage. These "wings" are called the lobes of the thyroid, with the middle section being called the isthmus. The thyroid gland produces, stores, and secretes the thyroid hormones thyroxine (T4) and triiodothyronine (T3) into the bloodstream. The thyroid does this as a response to a hormone produced by the pituitary gland, called thyroid stimulating hormone, or TSH. When the thyroid gland is "turned on" by TSH, it increases its uptake of iodine, which is required to make thyroid hormone. The principal cells of the thyroid are called follicular cells. These calls are mainly responsible for the production and secretion of thyroid hormones. Thyroid hormone plays an important role in controlling our metabolic rate. Many functions such as body temperature and heart rate are regulated by thyroid hormone. Too much thyroid hormone in your system is called hyperthyroidism, while too little is called hypothyroidism. An imbalance of thyroid hormone may cause serious problems if not properly treated. There are other rare types of cancers that may be found in the thyroid including lymphomas (cancer of the lymph gland cells), and metastases (cancers from other sites that have spread to the thyroid gland, such as melanoma, breast cancer, renal cell cancer, or lung cancer). What causes thyroid cancer and am I at risk? The most firmly established risk factor for the development of thyroid cancer is having had exposure to ionizing radiation to the neck area at a young age (18 years old or younger). This is supported by the high incidence of thyroid cancer seen in many populations exposed to radiation. This includes children 18 years or younger treated with radiation therapy for cancers such as Hodgkin's disease or nasopharyngeal cancer, or as part of their therapy to prevent leukemia from spreading to the brain. In addition, children who received total body irradiation in preparation for bone marrow transplantation are also at higher risk. Radiation therapy was also used in the 1940-1960s for benign conditions like acne, and this population has an increased risk for thyroid cancer. Children at the time of the atomic blasts at Nagasaki and Hiroshima, or of the Chernobyl nuclear plant explosion in 1986 also have a greater incidence of thyroid cancer. In fact, thyroid cancer is one of the most common cancers noted in populations exposed to large doses of radiation through accident or war. There is usually a delay of at least a few decades between exposure and the development of cancer. However the younger the patient is at the time of radiation exposure, the higher his or her risk is of developing thyroid cancer. There is also a genetic link to thyroid cancers demonstrated in both familial medullary thyroid carcinoma (FMTC) and familial non medullary thyroid cancer (FNMTC). Five to fifteen percent of thyroid cancers may be familial associated tumors. Familial medullary thyroid cancer is associated with multiple endocrine neoplasia (MEN) type 2A/B syndrome and familial medullary thyroid cancer. Patients with MEN type 2 may also develop other endocrine tumors in their parathyroid gland and/or adrenal tumors, called pheochromocytoma. FNMTC may present more aggressively than other thyroid tumors; often with multifocal, bilateral presentation, vascular involvement, and lymph node metastases. These tumors may also have a higher risk of recurrence and distant metastases. In order to be diagnosed with a familial type of thyroid cancer, 3 first-degree relatives must also be diagnosed with thyroid cancer. The genetic basis for this familial syndrome is not well understood. As most cases of thyroid cancers are sporadic and not associated with any risk factors, there is no method to prevent the development of thyroid cancer. Careful examination of the thyroid and consideration of screening for patients at high risk could be considered. In addition, it is important that the thyroid is shielded in children who undergo diagnostic X-ray procedures, such as dental X-rays. If you have a family history of thyroid cancer, be sure to notify your primary care provider. Preventive screening in families with a strong FNMTC history can be helpful in early detection and treatment. What screening tests are used for thyroid cancer? The early detection of thyroid cancers is generally through careful visual and physical examination of the neck. Palpation of the neck will detect many clinically significant thyroid cancers, which is part of a routine physical exam. In addition, the thyroid gland is included on many radiology studies performed to evaluate other organs, such as CT scans of the lungs and cervical spine. All patients suspected to have thyroid nodules, either from physical examination or from another radiology study, should have a thyroid ultrasound performed to take a picture of the thyroid. Thyroid ultrasound uses sound waves to image the thyroid gland and surrounding structures. The ultrasound appearance of the nodule can help healthcare providers determine if a fine-needle aspiration biopsy is required to further evaluate the nodule. There is no evidence that it is cost-effective to perform ultrasounds to screen for thyroid nodules in the general population. Notably, ultrasound detects the majority of small (<1 cm) incidental thyroid cancers, which are unlikely to affect the survival of most patients. Screening for medullary thyroid cancer, such as MEN type 2, can be quite different. The present recommendation for the majority of patients with a genetic mutation associated with MEN2A, MEN2B or FMTC is to undergo a prophylactic total thyroidectomy (complete removal of the thyroid) to prevent the development of a possibly aggressive medullary thyroid cancer. Genetic testing is important at a young age in families with a strong family history of MEN2 associated cancers. The most common sign of thyroid cancer is an asymptomatic thyroid nodule, identified on physical exam or found incidentally on a radiologic scan. As the thyroid gland is a fairly superficial organ in the neck, a thyroid nodule could be noticed early, at which time medical attention should be sought. Not every thyroid nodule a thyroid cancer. In fact, 95% of thyroid nodules are benign (non-cancerous). Less commonly, thyroid cancer can present as a large mass in the neck. The large mass can be located either in the region of the thyroid, representing the primary thyroid cancer, or in a separate region of the neck, representing a spread of cancer to the lymph nodes. Thyroid tumors can also at times present as hoarseness of the voice or with symptoms of tracheal or esophageal compression, such as shortness of breath, air hunger, difficult or painful swallowing, or neck pain. Once a thyroid nodule is found, the next steps are used to determine if the nodule represents a benign (non-cancerous) growth or malignant (cancerous) tumor. A careful physical exam should be done by a healthcare provider, with attention to the examination of the neck to evaluate for the presence of enlarged lymph nodes. Blood tests are performed to determine the function of the thyroid gland. If laboratory tests indicate an over-functioning thyroid gland, then additional tests will be performed to determine if the nodule is composed of benign thyroid tissue that is overproducing thyroid hormone. A biopsy is not usually required for benign, "functioning" nodules. A thyroid scan will help distinguish this nodule. This scan is a nuclear medicine study using radioactive iodine. Functioning thyroid tissue takes up iodine to produce normal thyroid hormones. Therefore, the small amount of radioactive iodine used to take pictures will be taken up by those areas of the thyroid that are producing thyroid hormone. Hence, a nodule composed of functioning thyroid tissue will appear "hot" in these nuclear medicine scans (i.e., concentrating the radioactive iodine). These "hot nodules" are almost always benign and often require no further work-up for malignancy. Nodules that are "cold" (i.e., do not take up much iodine) are also often benign, though can be malignant in 15-20% of cases. Therefore, these deserve more attention and further work-up. Most patients (>95%) with thyroid nodules have normal thyroid function and the nuclear medicine thyroid scan is not indicated. For these patients, the next step in investigating a nodule is a thyroid ultrasound. Ultrasound has the ability to provide additional information about a nodule, such as its composition (solid or cystic) and its appearance (hypoechoic or dark versus hyperechoic or bright), which may increase or decrease its likelihood of being cancer. In addition, ultrasound may detect more suspicious nodules that are not able to be detected on physical exam. Ultrasound may also identify abnormal lymph nodes around the thyroid gland, which could be evaluated at the same time as the thyroid nodule. Ultrasound is an extremely powerful tool in obtaining information about a thyroid nodule. Fine needle aspiration involves placing a thin needle into the nodule, and drawing up cells from it so that they can be analyzed. Usually this is done under ultrasound guidance, meaning that an ultrasound is performed at the time of the procedure to visualize the needle placement into the nodule. FNA has a diagnostic accuracy of over 98%, though it is highly dependent on the healthcare provider's expertise in performing the test and the pathologist's experience in interpreting the results. Up to 30% of FNA biopsies will return results that are inconclusive, including follicular thyroid cancer, which cannot be diagnosed by cytology alone, or an "indeterminate" result. These patients are referred for surgery, though most will end up finding out the nodule was not cancerous. Molecular-based testing is available to help determine which nodules are benign based on their genetic profile. By analyzing the samples genetic make up, doctors can identify patients who most likely have a benign nodule and therefore, can avoid surgery in these patients. Thyroid cancer spreads most commonly through the lymphatic system. The lymphatic circulation is a complete circulation system in the body (somewhat like the blood circulatory system) that drains into various lymph nodes. When cancer cells access the lymphatic system, they can travel to lymph nodes and start new sites of cancer. This is called lymphatic spread, and may denote a poorer prognosis. Thyroid cancer can commonly spread to the lymph nodes of the neck, though (especially with papillary thyroid cancer) this may not carry a worse outcome. The lymph nodes commonly involved in thyroid cancer are those found in the anterior portion (front) of the neck, called the cervical or jugular lymph node chains. They can be found in front of the large muscles on either side of the neck that contract when the head is turned from side to side. Tumor cells that spread to the jugular lymph nodes can then spread to the "supraclavicular" lymph nodes (found behind the collarbone) and to other lymph nodes in the neck. Eventually, they can spread to lymph nodes in the chest, called the mediastinal lymph nodes. At diagnosis, up to 30% of patients have evidence of thyroid cancer spread found on ultrasound examination of the neck lymph nodes before surgery. This information helps the surgeon determine the optimal surgical procedure for the patient. The staging of a cancer describes how much it has grown and the extent of the disease. Cancers cause problems because they spread and can disrupt the functioning of normal organs. One way thyroid cancers can spread is by local extension to invade through the normal structures in the throat and into adjacent structures in the neck. While this is a fairly rare complication of thyroid cancers, this tumor can spread to include the trachea and esophagus. This can cause airway compromise and difficulty swallowing. 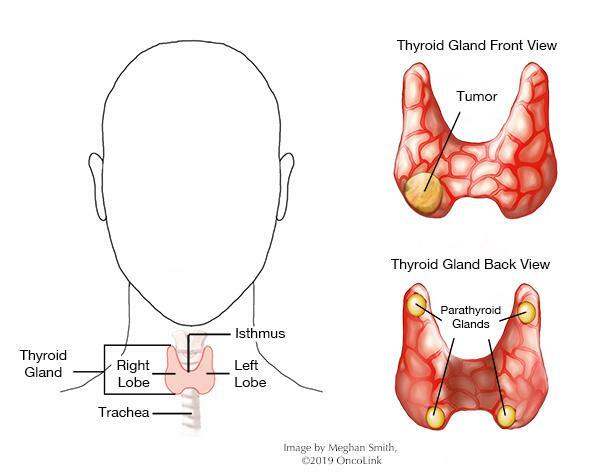 The staging system used in thyroid cancer is designed to describe the extent of disease in both the thyroid itself and the neck (with spread to the lymph nodes). The staging system used to describe thyroid tumors is the "TNM system", as described by the American Joint Committee on Cancer. The TNM systems are used to describe many types of cancers. They have three components: T-describing the extent of the "primary" tumor (the tumor in the thyroid itself); N-describing the spread to the lymph nodes; M-describing the spread to other organs (i.e.-metastases). Your healthcare provider will use the results of the diagnostic work up to assign the TNM result. Thyroid cancer also takes into account the age of the patient in the stage grouping. Though complicated, these staging systems help providers determine the extent of the cancer, and therefore make treatment decisions regarding a patient's cancer. The stage of cancer, or extent of disease, is based on the information gathered through the various tests done (described above) as the diagnosis and work-up of the cancer is being performed. The TNM breakdown is quite technical and is provided at the end of this article for your reference. The treatment of thyroid cancer is dependent on the type (histopathology) of thyroid cancer. It can involve multiple types of treatment including surgery, radioactive iodine, radiation therapy, chemotherapy/targeted therapy and/or thyroid suppressive therapy. Surgery plays a central role in the treatment of thyroid cancer. The goal is removal of the tumor. There are several options for surgical procedures to treat thyroid cancer including total thyroidectomy (the removal of the entire thyroid gland), near total thyroidectomy (leaving only a small remnant of thyroid tissue with parathyroid glands, which are attached to the thyroid) and lobectomy (the removal of a single lobe of the thyroid gland). If the thyroid gland is not completely removed at the first surgical procedure, the patient is always at risk for recurrence in the portion of the thyroid left behind. Secondary operations to remove the remaining portion of the thyroid gland can also be performed. However, in patients with small (<1cm) papillary thyroid cancers, a lobectomy may be appropriate. All patients suspected to have thyroid cancer should have an ultrasound to evaluate the lymph nodes in the neck for spread of the thyroid cancer. If thyroid cancer is found to have spread to these lymph nodes, the surgeon will remove the lymph nodes at the same time the thyroid is removed. However, the role of a prophylactic removal of the lymph nodes of the neck when they are not obviously involved is unclear. The lymph nodes very close to the thyroid gland are usually dissected without much difficulty and therefore should be removed. Depending on the pathologic staging, patients may require additional therapy after surgery. The first and simplest is the use of supplemental thyroid hormone following surgery. Patients with near total or total thyroidectomies require supplemental thyroid hormone because the thyroid gland is no longer present. But, thyroid hormone can also act as a thyroid cancer therapy. The standard of care is to give slightly more thyroid hormone than the patient would otherwise require because this has been shown to keep any remaining thyroid cancer "asleep" or inactive through a feedback system. In other words, if the body detects that there is a sufficient amount of thyroid hormone already present (through supplementation), it will not produce signals to "turn on" the thyroid to grow and produce thyroid hormone itself. This can be quite successful in keeping residual thyroid cancers dormant. As thyroid tissue, and some thyroid cancers, preferentially take up iodine into their cells as part of normal functioning, the use of radioactive iodine, I-131, (RAI) may also be used to kill any remaining thyroid tissue (called "remnant" ablation) and potentially any thyroid cancer cells. RAI has been shown to improve the outcome of patients with higher risk disease (specifically for patients with Stage II, III, and IV disease). The iodine is taken up into the cell and the radiation within the radioactive iodine itself is released locally, delivering a lethal dose of radiation to these cells. This treatment works well because normal thyroid cells and some thyroid cancer cells preferentially absorb and retain iodine, so other tissues are rarely affected. However, for the first few days after treatment with RAI, patients emit radiation and should avoid close contact with others. Indications for RAI include tumors with high risk features, such as sizes >2 cm, invasion of the cancer through the thyroid capsule or into the soft tissues of the neck, spread to the lymph nodes or more distantly, or recurrent disease (thyroid cancer that has come back). RAI can be a very effective therapy in many cases, though some thyroid cancers do not have ability to take up iodine, rendering RAI useless. Radiation therapy has been shown to be effective in certain subsets of patients; in particular, those with aggressive types of thyroid cancer, those at high risk of recurrence, or those with residual disease still present after surgery. High risk features include incomplete resection, spread outside the thyroid gland to soft tissues of the neck or to regional lymph nodes, certain histological subtypes of thyroid cancer, and those cancers that do not take up RAI. It is also used in many cases of anaplastic thyroid cancer to attempt to halt this aggressive disease. Chemotherapy has not classically been used in the treatment of thyroid cancer. However, chemotherapy drugs such as paclitaxel, doxorubicin and carboplatin may sometimes be used in the treatment of metastatic disease, for anaplastic thyroid cancers, or disease that has progressed after RAI or radiation therapy. Several types of targeted therapy can be used in the targeted treatment of certain thyroid cancers. These medications target specific mutations in cancer cells. These medications include lenvatinib, sorafenib, sunitinib, axitinib, everolimus, vandetanib, cabozantinib, pazopanib, dabrafenib and trametinib. Survivors of thyroid cancers require lifelong monitoring and survivorship care. There are several reasons for this including appropriate monitoring and dosage of thyroid replacement hormone and evaluation for residual disease or recurrence. Thyroid cancer can recur anytime, even years after initial successful treatment. The frequency and type of testing you will require depends on the type of thyroid cancer you were treated for as well as the type of treatment(s) you have received. Typically, survivors require regular physical neck examinations. 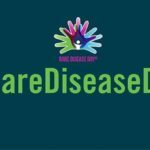 These are typically done every 3-6 months for the first 1-2 years after treatment and then once a year after that initial time period. You may also need periodic testing including TSH, T4, T3 and Thyroglobulin (Tg) levels and neck ultrasound. Calcitonin and carcinoembryonic antigen (CEA) are tumor markers for medullary thyroid cancers and will be monitored regularly in these patients. For survivors with medium or high risk tumors, you may also require a RAI whole body scan, CT/MRI, or PET scan to monitor for potential metastasis or recurrent disease. Provides education and support for people with thyroid cancer as well as funds research into the disease. 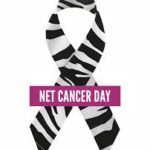 A non-profit organization which provides education and support to people with thyroid cancer and the public. Provides education about various endocrine conditions, including thyroid cancers. An advocacy organization dedicated to supporting research for thyroid cancer treatments.